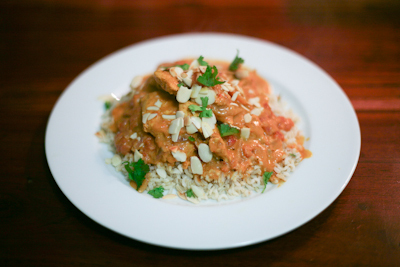 Chicken tikka masala is a staple Indian dish, one I grew up on in Kwa-Zulu Natal. Creamy, full and fragrant, without the bite of other curry variants. Again, as with a few of the others, the base is a tomato/coconut blend, in hindsight I should have drained off a little of the tomato juice as I found the curry a little runny. Simple and easy to prepare, fusing spices like tumeric, garam masala, fresh ginger, red chilli and tika masala paste, then garnished with fresh coriander (home grown of course!) and flaked almonds. Certainly 20 minute worthy, just remember to have some Poppadoms or Naan bread handy to lap up the extra sauce.